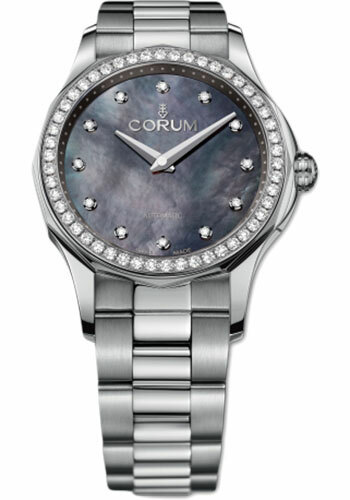 32 mm stainless steel case, 8.90 mm thick, sapphire back, diamond bezel, double antireflective sapphire crystal, black mother-of-pearl dial set with diamonds, caliber CO 400 automatic movement with hours and minutes, approximately 40 hour of power reserve, stainless steel bracelet, triple-blade folding buckle. Water resistant to 50 m. (Old reference 400.100.47/V200 PN11). 32 mm stainless steel case, 8.90 mm thick, sapphire back, double antireflective sapphire crystal, white mother-of-pearl dial with transferred nautical flags as hour markers, rhodium-plated hands, caliber CO 400 automatic movement with hours and minutes, approximately 40 hour of power reserve, white rubber strap, pin buckle. Water resistant to 50 m. (Old reference 400.100.20/0379 PN12). 32 mm stainless steel case, 8.90 mm thick, sapphire back, double antireflective sapphire crystal, white mother-of-pearl dial with transferred nautical flags as hour markers, rhodium-plated hands, caliber CO 400 automatic movement with hours and minutes, approximately 40 hour of power reserve, stainless steel bracelet, triple-blade folding buckle. Water resistant to 50 m. (Old reference 400.100.20/V200 PN12).